When I compiled in devc++ compiler, output is not printed. Is there any logical error? This program should accept a number from the user, print the lowest palindrome greater than the given number. You have not initialized the flag variable. if(a[i]==a[j]) then the flag will remain uninitialized and may create problems while cheking the if condition unless the default value will be 0 for it. (I am not sure that it would be). Also I can see that the value of flag will never turn 1 according to your code. Not the answer you're looking for? Browse other questions tagged c++14 or ask your own question. Why should I not #include <bits/stdc++.h>? 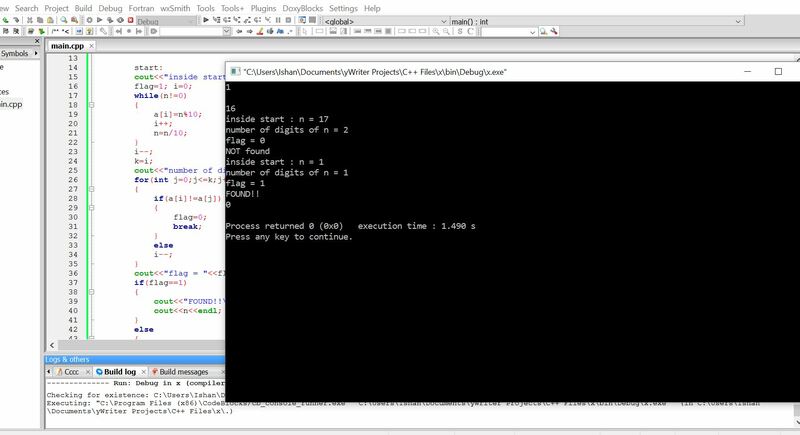 C++14 Smart Pointers: Why this output? the following print tree function does not work why? Why string::find() is not working in this code?